My neighbour James Roxburgh has a problem: his 42,500-mile, 1997-reg Ferrari F355 Berlinetta manual is now worth so much money, he daren’t drive it. He paid £34,000 for the car five years ago in a private deal but has just been offered £80,000 for it by a specialist dealer. Welcome to the crazy world of used supercars, where sky-high prices for the best examples mean enthusiasts such as James have cars so valuable that they’re terrified to drive them. Tim Marlow, head of the prestige division at Magnitude Finance, a vehicle finance broker that will do £75 million of business this year lending about £70,000 per car, says the rising number of lenders is partly to blame. Marlow says responsible lenders need to know what’s rising in value and what isn’t because many purchases are financed on a form of hire purchase that has a final payment, called a balloon, at the end of the term. The higher the balloon, the lower the monthly repayments. However, the customer has to eventually pay the balloon – unlike a personal contract purchase deal, there’s no handing the car back and walking away. A 60% balloon on a Lamborghini Gallardo is typical, but if the car isn’t perfect in every way, it won’t be worth that. This means that should the owner try to sell it to the trade to settle their debt, they may face a large shortfall. Cars you’re scared to drive, balloon payments you can’t afford, some cars worth much less than others – it makes you wonder why anyone would buy a used supercar until, that is, you sit in a Ferrari and imagine cruising down the high street. One man who spends his days turning that dream into a reality is Mark Rose. He is head buyer at HR Owen, the supercar dealer group. His team feeds the sales force with everything from Lambos to Bentleys, Astons to Ferraris. They buy 45 cars a month, 80% of them from private sellers – and there’s no room for error. Naturally, Rose and his team know their prices but, crucially, they also know what it costs to prepare a car for sale. The last thing they want is Barry Ebbs, service advisor at HR Owen’s workshop in north London, hitting them with a huge pre-sale prep bill. 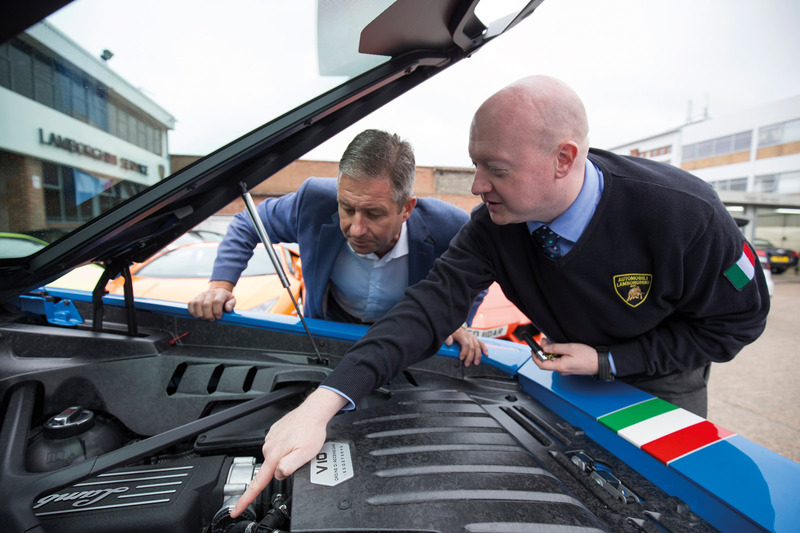 I join Ebbs as he inspects the underside of a Huracán. And circumstances do change to the extent that someone who has a supercar on finance may no longer be able to insure it. Last year, CAP HPI Crush Watch, the service that enables the police to reunite uninsured cars with the finance companies that own them, saved two Aventadors, two Huracáns, four Ferrari 458s and one McLaren 12C from the police crusher. Despite all the risks, new players are still entering the supercar market. One of the latest is Renaissance Classics in Ripley, Surrey. It specialises in Ferraris and Porsches, and began trading in May. It’s early days – so far, the company has sold 20 cars – but founder Keith Sohl has big ambitions. Meanwhile, out front, Sohl plans to add to the company’s growing stock of what he calls ‘turnover cars’, such as £50,000 911s (the 996 series is popular with first-timers), the occasional R8 manual and Ferrari F348s, 430s and 360s, plus sub-£100,000 ‘investment cars’. About 250 miles farther north in Knaresborough is a supercar dealer that started 20 years ago. Today, Redline Specialist Cars is possibly the UK’s most successful supercar dealer, selling 300 a year. But what if you cut dealers out of the loop by buying at an auction? What kinds of supercars end up here? BCA Blackbushe hosts what it calls a Top Car sale of prestige and performance cars twice a month. If you’re lucky, there may be a couple of other prestige sales running as well. I’m lucky. The day I visit, HR Owen and Porsche Retail Group are offloading below-par trade-ins. There are some tempting pickings but, as with all auctions, it pays to go a few times just to get used to the system, the pace and, of course, the prices. Take a friend or a specialist technician who knows their supercars. Some cars are covered by BCA’s Assured scheme, a 30-point AA mechanical check that costs £40. However, the cars I’m interested in are simply described as having no major mechanical faults, or sold as seen. Among the Top Car lots is a 39,000-mile, 2005-reg Ferrari F430 F1 Spider. Finished in red, it has had six services (the last one at 38,000 miles) and three keepers. It’s not in the best condition (the nearside front wing has had paint, the driver’s side mirror is taped on and one corner of the hood is slightly damaged). If I were buying, I’d go through that service history carefully and try to check if the exhaust manifold is cracked (a problem on the 430). Bids reach £64,600 before it is withdrawn. It’s not the only one that fails to meet its reserve. Still, that’s to be expected when you have cars entered by individuals. After the sale, the auction company may act as go-between, enabling buyer and seller to agree a deal. 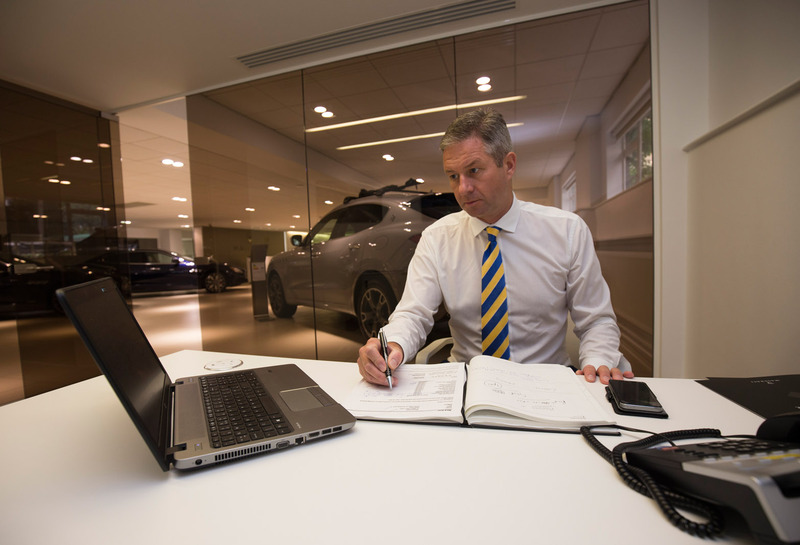 In group sales, like HR Owen’s, cars tend to sell on the hammer because corporate sellers can afford to spread their gains and losses across multiple lots. Still, buying at auction is not for me. Until I can afford to run a supercar, never mind buy one, I’ll duck out. I leave with Wilson’s words of warning ringing in my ears: “If a supercar goes through the auctions, there’s a usually a reason – the wrong one.” Perhaps I’ll just go round to James’s place and we can look at the F355 in his garage while he tells me how much he’d like to drive it, if only he could afford to. FERRARI F430 F1 SPIDER 2005/05, 39k miles, £64,600 (provisional): Partial history, some superficial work required, ‘no major mechanical faults’. AUDI R8 V8 COUPE 2008/58,50kmiles, £50,000: Five services, 10 former keepers, clean with ‘no mechanical faults’. PORSCHE 911 TURBO (997) 2006/06, 51k miles, £50,000: Five services, six former keepers, but a great spec and a good colour. ASTON MARTIN VANQUISH 2013/13, 39k miles, £87,500: Full main dealer history and a great spec. MERCEDES-BENZ SL63 AMG 2009, 31k miles, £32,000: Not a supercar but not far off. Full service history, nice spec. Beware of clocking: It’s a growing problem. Even a couple of thousand miles off the odometer can add thousands of pounds to the price of a car. Buy the manual variant: Because fewer were ordered as new, stick-shift supercars – such as the Porsche 911 Turbo (977), Audi R8 V10 or any manual Aston V12 – are rising in value. Buy in winter: Demand for supercars slackens in winter, meaning prices soften. Do your homework: Know prices, the market and specifications before you start. Avoid ignorant lenders: Beware finance brokers who aren’t supercar experts. Buy a Ferrari: Sooner or later, every Ferrari has its moment in the sun. Buy rare: Low production numbers are a good indicator of future investment potential. Buy the special edition: A good one is a smart way to dodge oversupply and preserve value. Get it inspected: The professionals do, so should you. Establish clear title: The keeper isn’t always the owner, which, on an expensive supercar, could be a disaster. I hope i am not the only one to see this as a guide about how to make the money lenders some more money. How daft am i that i assumed supercars to be a toy you paid cash for, because of the joy of owning and more importantly, driving. My guide, buy what you can afford (to lose), and what you love to drive. "All things are relative but supercars really are much more affordable these days,” says sales director John Graeme. “Some customers buy as many as six at a time for investment; their money’s not making anything in the bank, so if they buy right, why not?" I could have sworn I've read that exact same comment sometime ago. Is this really a new story or has it been pulled from the archives? I have a big problem with this story about cars appreciating which is highlighted by John Grahams comment. If these cars are going to appreciate then why is the garage selling them? Wouldn't it be better to keep hold of them? Yep, doesn't matter you're buying a £2000 Aygo or a £200,000 Aventador, you're still fed the same sales bull****. Seems that the market is being coerced up, until it crashes big mega style,what will the losses be? will it be another scandal? can see many of these losing 75% too many cars will be chasing too few customers,I assumed that most people would be paying cash from their own pocket, reading this completely put me off the idea at present .a six year Avendador for £60k would appeal,so can only hope,but my gain would be catastrophe for many punters and dealers along with the financiers. I fthe engine blows you would have a major problem even at a £60k investment, but there must be many fools chasing up prices to almost new prices . Although Alfieri will always be remembered for his time at Maserati, he is less well known for developing the Countach 5000S, QV and Jalpa. 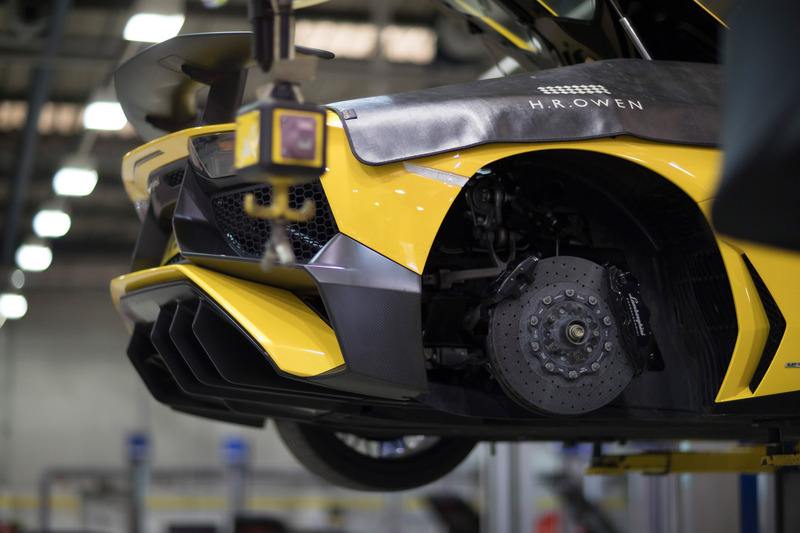 I seem to recall, in an interview with a British motoring magazine, him stating that the majority of Lamborghini's customers viewed their products as 'jewellery'. I guess not that much has changed in the last 30 years. Alfieri was not only an engineering genius, he was also a realist. People view Lambos as jewellery? Well, that's good, because people normally take care of their jewellery. This is a bubble that doesn't need to burst to cause grief for the unwary. Even before you factor in the next (imminent?) downturn, oversupply and consequently falling prices, most owners find maintenance and restoration costs crippling. These have increased far faster than selling prices over the last 10 years.